Pizza, the most known Italian dish, was nominated to become World Heritage site, could not miss in our recipe. Thanks to blast chiller home’s Levitation function, you can get an excellent result every day of the year, regardless of humidity and weather choose the temperature and duration of leavening like the pros. In a bowl or in the planetary, pour water with salt and mix as long as the salt will melt. Then pour the flour and knead for few minutes, mix the yeast and olive oil. The dough should be soft and moist, but should not stick to hands. Create a ball and begin the levitation. Start the program LEVITATION˃ IMMEDIATE, set the temperature at 28° C for 1 hour and START LIFE. Meanwhile prepare the sauce: heat tomato sauce with a pinch of salt and cut mozzarella. 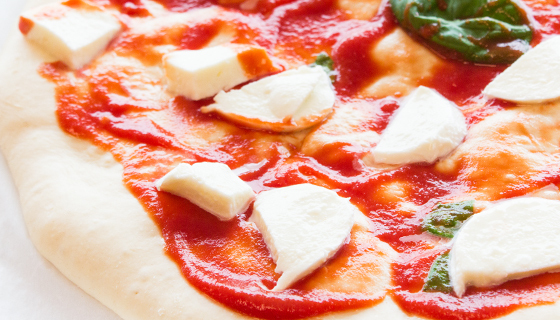 Preheat the oven at 225° C and, after the rising, season pizza with tomato sauce, mozzarella, basil and olive oil. Cook in the oven for 15/20 minutes at 225° C.
The pizza is well risen and they formed the cavities within the dough because, thanks to LIFE’s LEVITATION function, the rise was successful.